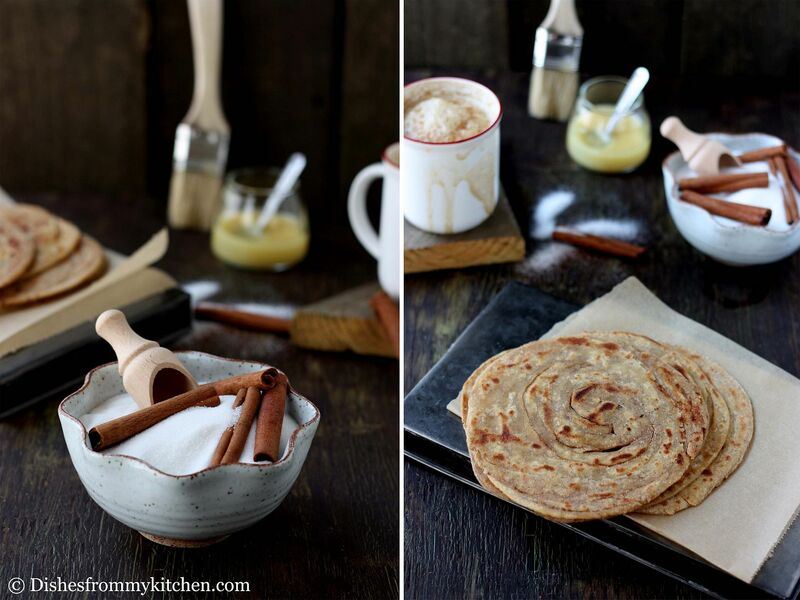 Dishesfrommykitchen: CINNAMON PARATHA(LAYERED INDIAN BREAD) !!! FLAKY,TASTY AND HEALTHY !!! CINNAMON PARATHA(LAYERED INDIAN BREAD) !!! FLAKY,TASTY AND HEALTHY !!! This post is more attached with my childhood memories. Yes whenever my mom makes savory (spices mixed with the dough) paratha we used to enjoy them with atleast one sweet paratha. The same way when I make paratha my son would demand for one sweet paratha. Back home my mom would just use sugar and clarified butter for making sweet paratha. 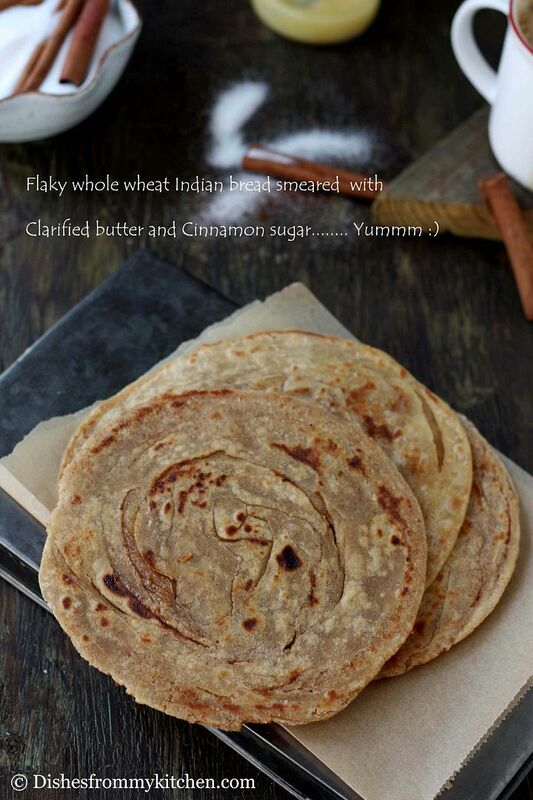 Since we love cinnamon and especially my kiddo, I use to make paratha using cinnamon sugar. 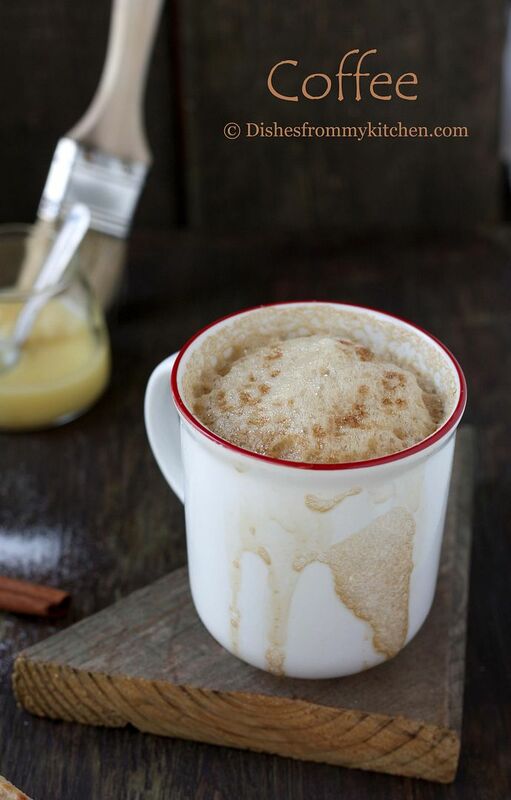 If you are cinnamon lover I bet you will certainly love this and make it very often. This paratha is wonderful Tea time snack and a healthier snack for kids. If you are craving for sweet that too cinnamoooony, here you go...best and healthier way to satisfy your sweet craving. The nutty whole wheat flour, fresh clarified butter, sweet cinnamon flavor mmmm it is yummmm:) This paratha is very flaky and tasty. You can also pack them for kid’s lunch box with some salad as well. I have also included the stepwise details for pleating and rolling the Cinnamon paratha with this post which will be helpful for understanding. Do write to me if you have any queries. Also see the notes/tips for making good paratha's before you proceed. The Paratha/Paratta can be done in various shapes and methods. 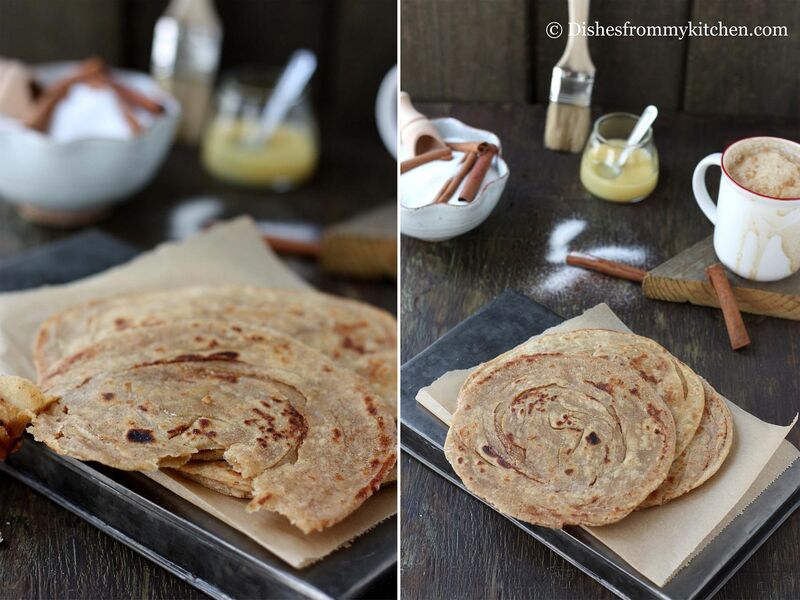 The Layered Paratha can be done in two styles. 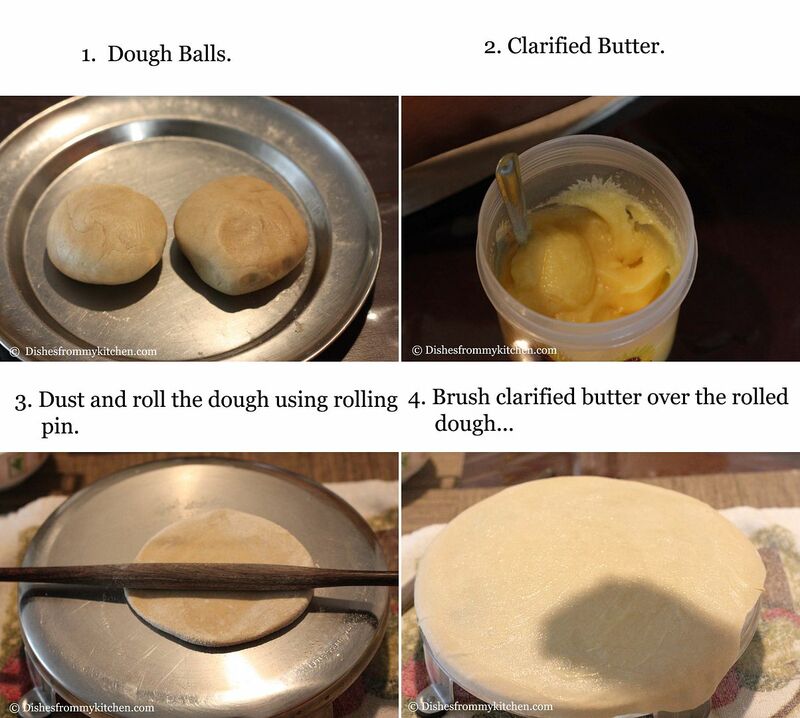 Style 1: In this method, the dough is rolled first and clarified butter or oil is brushed and folded. Then the folded dough is rolled again and cooked/toasted in the Pan/Tawa. While cooking it puffs up separating the layers and it becomes flaky. The folded dough can be rolled into any shapes like triangle, square or round. 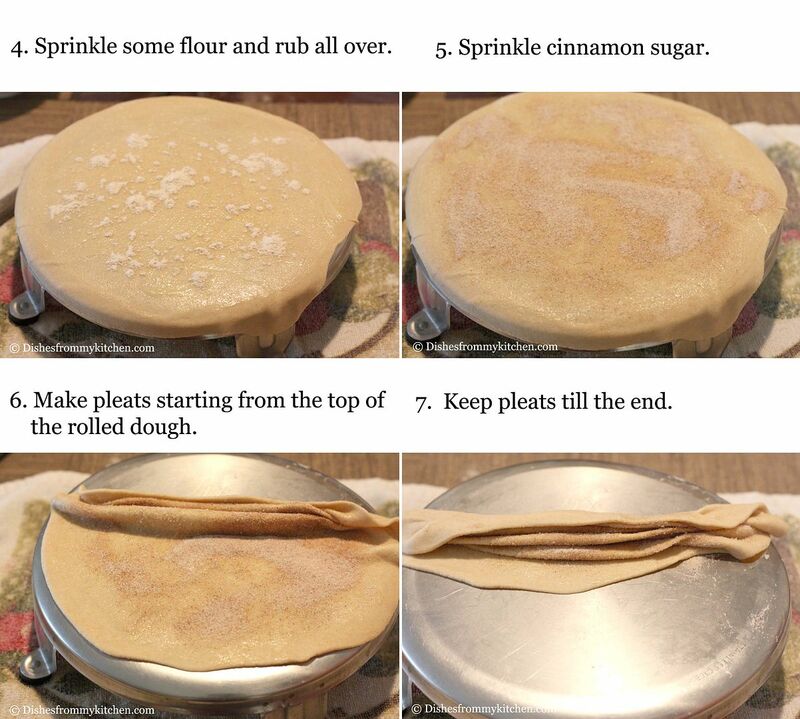 Style 2: Instead of folding method, we can also make pleats and roll the dough. I have posted this style today. These are Spiral Paratha which are nice and flaky. These are also called as Lachha paratha (Round in shape with multiple layers traditionally prepared in a tandoor) but it can also be made in the pan/Tawa too. You can incorporate any flavors like spices or herbs when you mix the dough and prepare it based on the above styles. Usually the paratha is served with some accompaniments like curry, pickle, raita or chutneys. But layered paratha with flavors is tasty by itself. Apart from the different folding and spicing method there is another one which is called stuffed paratha. The stuffed paratha is not layered. The vegetable of your choice can be prepared by adding some spices and it is stuffed into the dough balls. The dough balls are rolled and toasted/cooked in the pan by smearing oil, butter or clarified butter. When it’s cooked, it forms layers naturally. 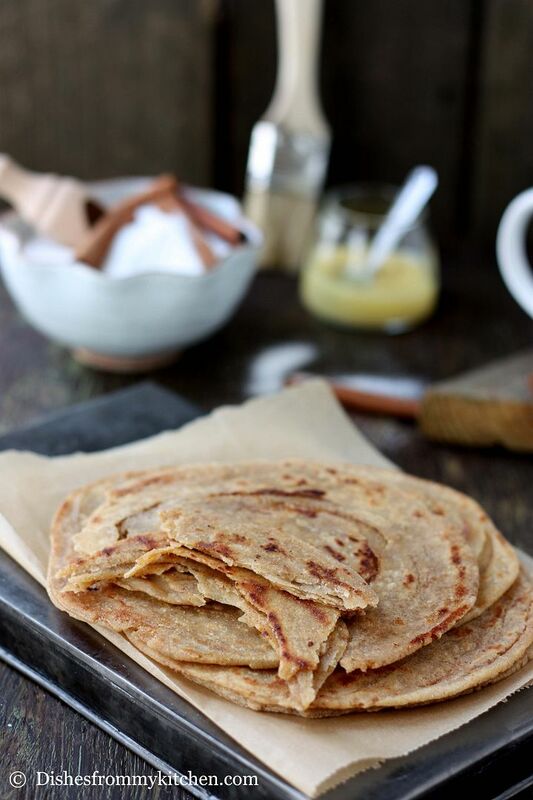 You can make the paratha with whole wheat flour, all purpose flour or the combination of both. I usually add less fat when mixing the dough. It’s again your preference to use either ghee or oil. So here you go how the sweet Paratha is made. You can follow the same procedure for making plain Paratha without adding Cinnamon Sugar. The measurement of sugar which I am giving is enough for our sweet level. If you want them very sweet you can always sprinkle more before rolling. 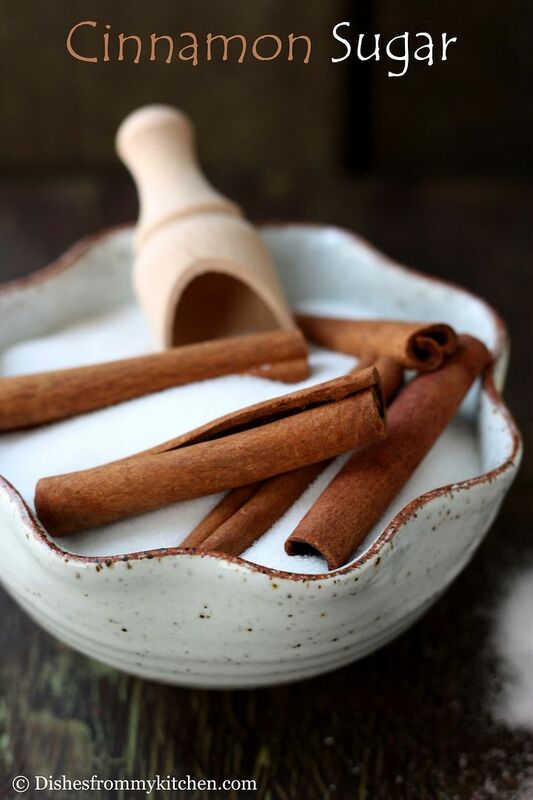 You can always increase or decrease the cinnamon powder according to your preference. Mix both sugar and cinnamon powder well and keep it aside. Look at my earlier post "Phulka - Indian bread cooked on open flame" for stepwise instructions. 1. Take Flour, clarified butter and salt in a big bowl. Rub with your fingers until they are mixed well. 2. Add water little by little to make soft pliable dough. See here for Tips and Tricks and details for MIXING THE DOUGH. 3. Cover with a damp kitchen towel and allow the dough to rest for atleast an hour. 1. Divide the dough to equal size balls. 2. Dust a ball with the flour and roll it for about 9" inch circle. 3. Brush the whole surface with 1/4 tsp of clarified butter using the brush. 4. 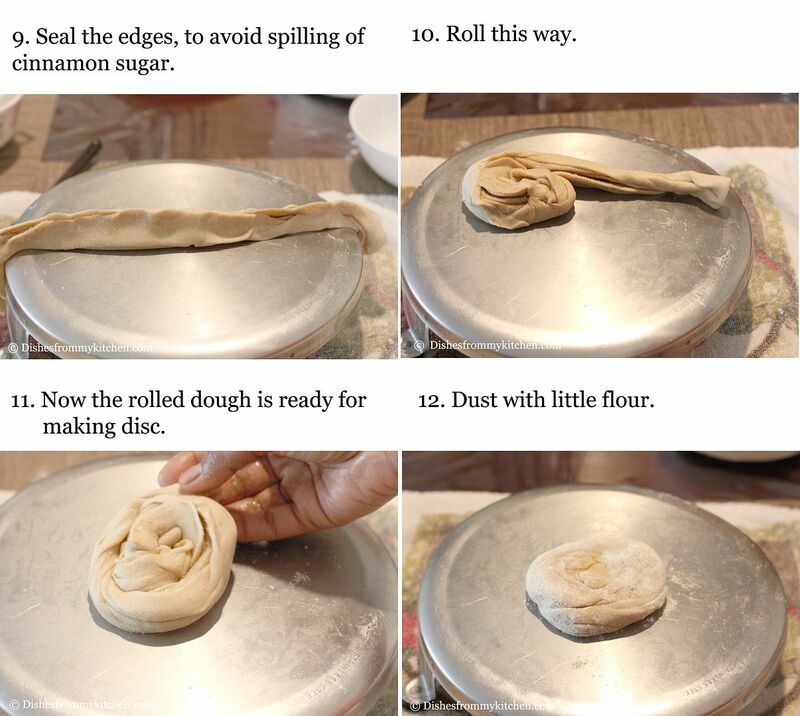 Sprinkle little flour and rub with your finger and sprinkle cinnamon sugar all over the rolled dough. 5. Now starting from one end make pleats until you reach other end. 6. Since we are using cinnamon sugar it may spill before you start rolling like a tail. To avoid this, seal the starting pleat and end pleat. Start rolling as shown in the picture, give it a press and keep it aside. 7. Do the same for all the dough balls. 1. Take the rolled dough dust with little flour, using the rolling pin with slight pressure (don't give so much pressure) make 6 1/2 " circle (discs). The thickness of the discs from the center to end has to be even. 2. In a heated pan, put the rolled paratha. When bubbles start to appear, smear some clarified butter or oil and flip to the other side. Now smear some more clarified butter or oil (Always cook them in medium flame so that it does not burn the sugar). 3. Cook until it turns light golden brown on both the sides; this takes approximately 30 to 40 seconds on each side. Once they are cooked keep them on a plate or cooling rack. 4. Repeat the same for all the dough. 5. 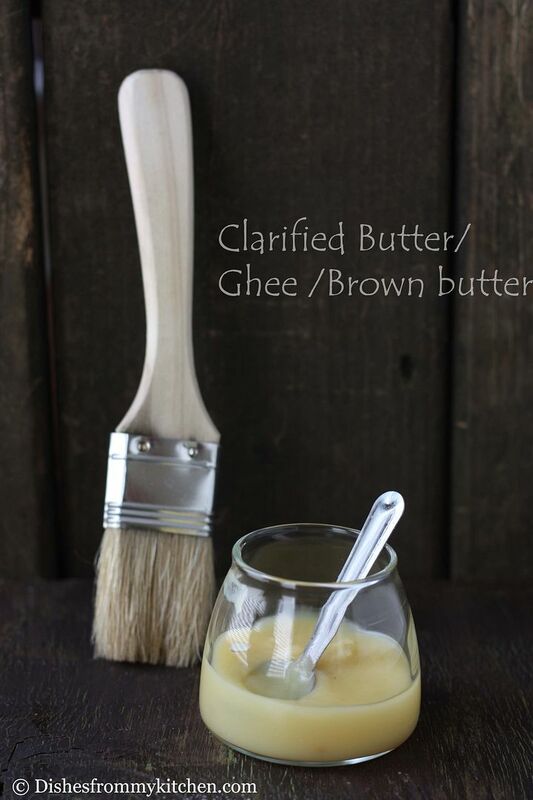 Serve hot by smearing little ghee on the top or you can serve in room temperature. 1. Using the clarified butter or oil is according to your preference. I suggest using oil while making the dough and clarified butter while toasting the paratha, if you are health or calorie conscious. 2. You can also use melted butter in the place of oil or clarified butter. 3. 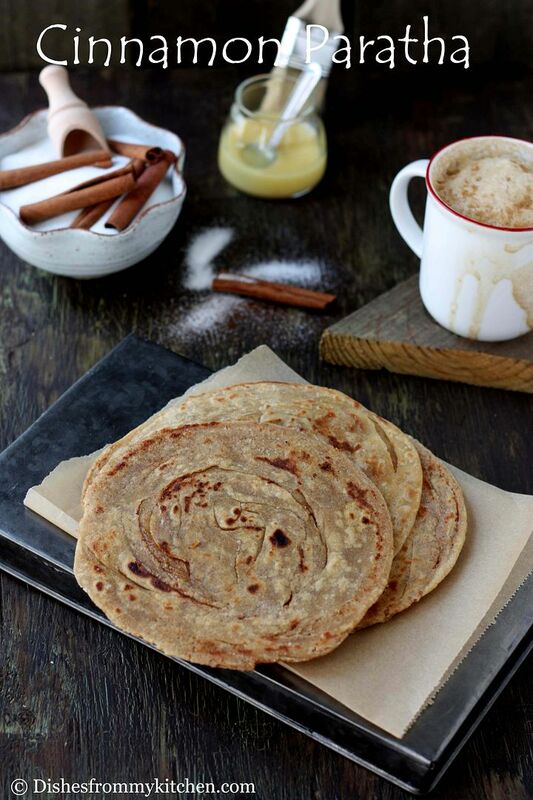 For making the plain paratha do follow the same procedure without the cinnamon sugar. 4. Always cook Paratha in medium flame for even cooking. 5. If you like it little crispy cook for few more seconds until it turns nice golden brown on both the sides. 6. 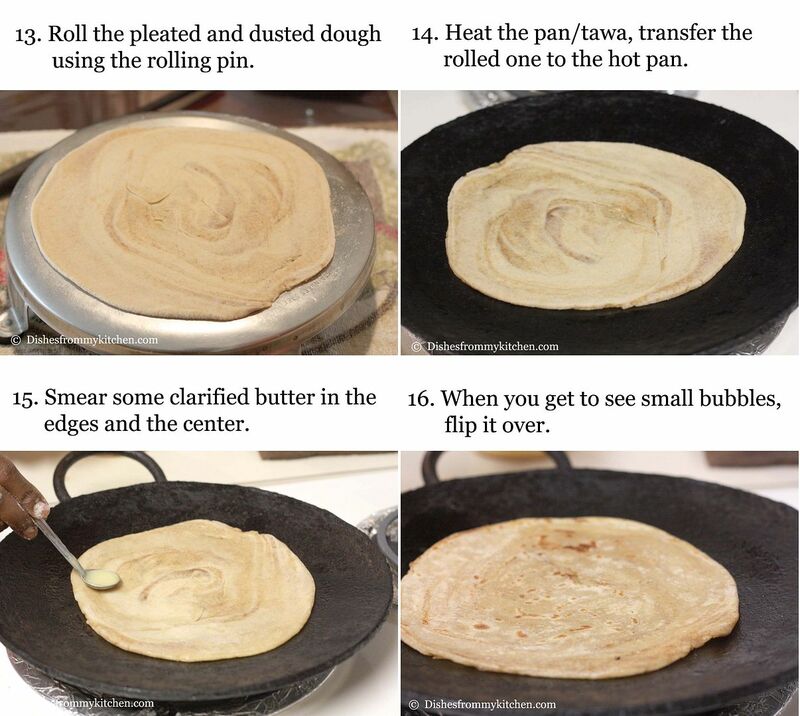 The Paratha should be little thick, crispy on outside and soft inside, so do not roll the dough into thin discs. 7. If you are making plain Paratha, make it little bigger. Instead of dividing the dough into 6 balls divide to 4, roll them little bigger and thicker. This kind of paratha is called Lachha paratha. Enjoyyyyyyyyyyy the Cinnamon sugar paratha at all times!!!! We make sugar paratha at times .. when we crave for desserts and at the same time feel lazy to make any! PS: I am waiting for your entry for DMBLGiT. Your photos are gorgeous .. you must send! 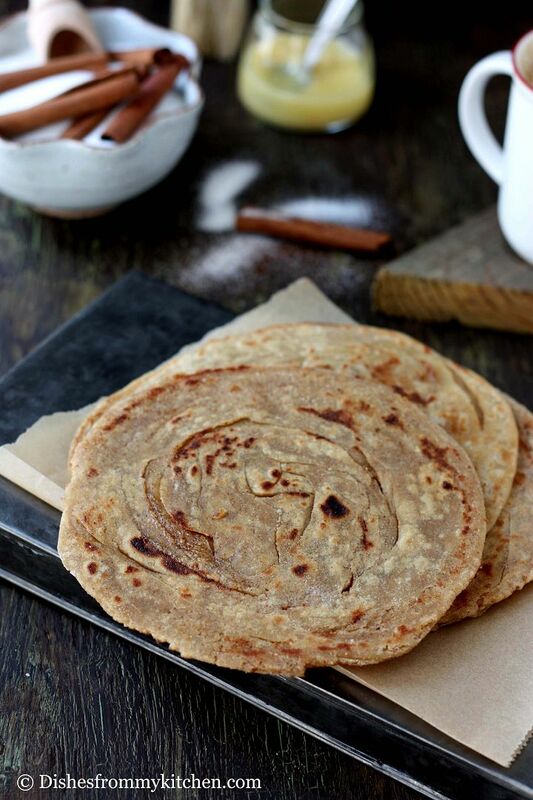 A paratha with cinnamon flavor is something I haven't attempted so far..Being my all time fav spice,this am adding to my bookmarks.Fabulous recipe. Yummy and delicious snack item. I am sure kids will love this. I make this paratha for my son's lunch box. Never tried adding cinnamon though. Will try it sometime. Thank you. First time to ur space & loved everything about it. The recipes, narration & the clicks, its all awesome. This sugar paratha brings back my childhood memories too. Happy to follow you. Inviting you to visit & follow my space. Great applause to you for sharing this recipe. so perfect and pics explain the recipe. Well done. Damn delicious,addictive and highly irresistible. Veeeery interesting.......& the pics are awesome. These must be very tasty flavoured with cinnamon sugar. Love them. Well, not too sure if it is absolutely healthy with that dab of butter.. but who cares. It looks so good! Your parathas look amazing and must taste just heavenly! Great pictures. This sounds wonderful! I have had "chinni" ka parantha but never a cinnamon flavored one. Brilliant!